Here’s a little something to keep you occupied while I’m away, to give you some ideas about Make Summer Camp, where the goal is to make ten things (with a few extra rules) before September 21. One of the things I get to do for my druidry practice is make a box for my sickle, and line it with linen. I am not a master carpenter, and I’ve been dreading this project for a long time. Not because I don’t want to make a box; but because I’m afraid the box will be very ugly when I’m done. The critical element of making a box is time, of course, and the next most critical element is patience. The solution, of course, is to create a temporary box. Or a practice box. Or a beginner’s box. This is—very definitely—a beginner’s box. I’ve never made a box before. 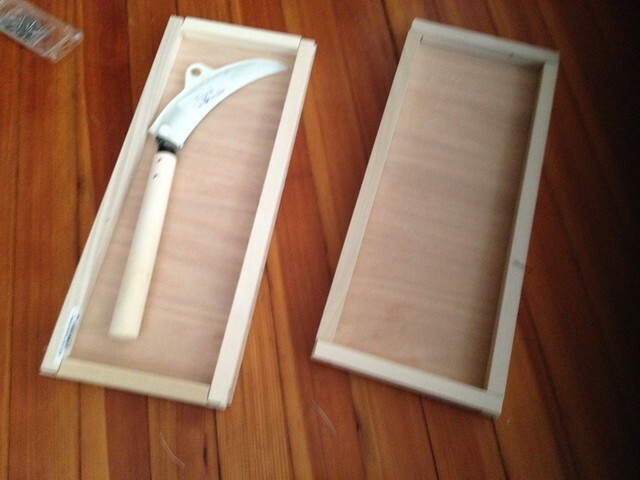 And this particular box doesn’t even have to be that complicated; it needs to hold a sickle, like this one. Sorry, I don’t have that super-curved kind that appears in all the Asterix cartoons. And I didn’t have any fine maple-wood or oak to build a box out of. What I had was some Luon, which is a kind of flooring material, and some 3/4″ square doweling. And, with some not very careful measuring, I was able to determine that the sickle I’d purchased to be my druidic sickle would fit inside a stack of two such dowels. Which mean that I could design the box around these elements. I left some extra space, because I intend to cut a piece of foam to fit, and carve away a small niche inside for the sickle to fit, before tucking in fabric to fill the remaining space. Today I cut some very rough lap-joints out of the ends of the doweling, and cut two pieces of Luon to form the floor and lid of the box. And… I went to the hardware store, where I found some nice hardware for the outside of the box: some hinges and some corner plates Which means that I can find some nice upholstery fabric, and attach the upholstery fabric to the outside of the box, and then attach these corners over that. It will be this padded upholstered box, and it will look nicer than this crudely made frame. 1) You’re going to have to go to the hardware store at least once during your project: to get parts, to get a tool you don’t have, to find a material you didn’t know you needed. Maybe it’s not the hardware store; maybe it’s the sewing supply store. It doesn’t really matter. At some point, Making involves spending money. 2) And this is more important than the trip to the store. Your efforts are going to be terrible. Unless you’ve got a home workshop, and you’ve been refining the craft you’re practicing while Making this particular project for twenty years, whatever you build or make is going to be so-so, at best. The longer you work on that project, too, without completing it, the more imperfections and dissatisfactions you’re likely to find. Chances are, if you’re reading this blog at all, you’re an apprentice. You’re not a master of this craft; you’re likely not even a journeyman. There will be mistakes and errors. The quality of your effort, at least as far as Make Summer Camp is concerned, is not really the point here. Your learning experience is. Because what you build with your hands, you build in your mind. This is kind of what John Michael Greer was getting at in one of his most recent columns, the Dream of the Machine. Technologies don’t invent themselves, and things don’t spontaneously assemble themselves out of parts. You have to have the idea of what it is that you’re building before you can build it; and the idea will refine and improve itself and gain greater solidity and reality the longer you work on it. But there’s also value in going ahead, and Making the thing you intend to Make. You learn from your errors; as Scott said to me, “Build the whole prototype first. That way you know what your mistakes are going to be.” And there’s truth in that, there really is. So don’t be too critical of your apprentice work. Be a Maker, and require the finished product to work. But don’t worry too much if it’s ugly or not quite right. You’ve not mastered the techniques of finishing and precision yet? That’s all right. It will be OK. The refinement comes with practice and diligence; but first with completion— it is better for me to build three or four sickle-boxes in turn, and learn from each one, than to devote care and attention to a box that is never quite finished.